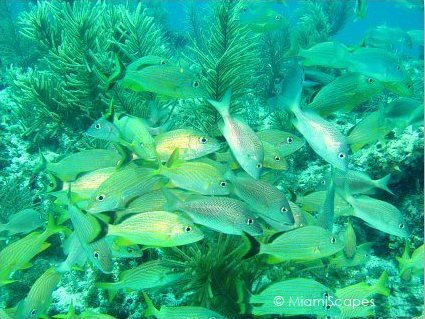 Snapper Ledge is another dive jewel of the Florida Keys in the vicinity of Key Largo. That you can expect to see large schools of fish here is an understatement! 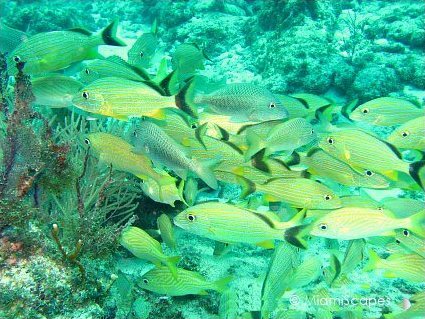 Not only is it common to see huge, thick, colossal schools of yellow snappers (where the reef gets its name from), there is also the striped grunts, yellow grunts, porkfish, goatfish, schoolmasters... in abundance. With depths ranging from 20 to 30 feet, the site is great for divers and suitable for snorkelers as well. The reef is fairly small, with only a handful of mooring buoys in contrast with the 30 plus buoys available at Molasses Reef, so even though Snapper Ledge is a frequently requested site by divers, snorkelers and specially photographers, it might not always be possible to accomodate everyone that wants to go on a particular day, weather conditions aside. We consider ourselves quite fortunate every time we are able to dive this spot, it really is a healthy and beautiful site, with lots of marine life everywhere you turn. No doubt that the large schools of fish are the stars of the show at Snapper Ledge, but it is not unusual to spot nurse sharks swimming around, moray eels underneath the ledges, lobster in between crevices and the great variety of colorful fish all reefs in the Florida Keys are so loved for: butterflyfish, blue tangs, angelfish, rock beauties... as well as the stunning coral formations. Check out this short video, the thick schools of striped and yellow grunts envelope us as soon as we descend, then a nurse shark shows up and makes the rounds. 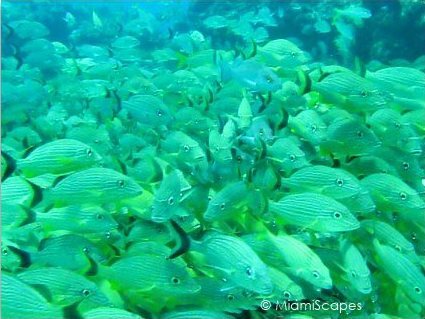 I don't think we have seen the concentration of fish like this at any other site in the Florida Keys, it truly is spectacular. 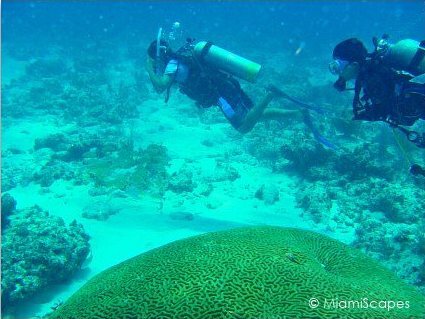 Brain coral boulders are also found at this site, as well as a profusion of soft corals, sea plumes, and seafans. It is always such a treat to dive this spot! A dive to Snapper Ledge is often combined with nearby Pickles Reef, where formations of Pillar coral seldom seen anywhere else are an attraction.